No longer produced, the Kimber Classic is an excellent example of the fine craftsmanship that goes into the modern 1911 pistol. 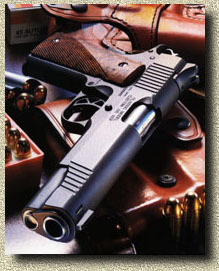 The Kimber Classic is a 1911-style, single-action pistol chambered in .45 ACP. It features many nice upgrades such as a custom trigger, fine wood grips and a special blueing.